The test 2HAND reliably assesses the eye to hand and hand to hand coordination. The layout of the track makes a comparison of the coordination performance possible for simple and more demanding tasks. Examination of visual-motor coordination (eye to hand and hand to hand coordination), by moving a dot on a track, through the coordination of both hands. Main areas of application: Aptitude diagnostics in the performance area, motor capacity diagnostics, industrial and organizational psychology, traffic psychology, and sport psychology. Two aptitude components lie at the center of the test requirement: sensomotor coordination between eye and hand as well as between both hands. The special difficulty in coordinating both hands lies in the capacity to visually assess left and right deviations between target and actual state and to correct with the hands accordingly. Additionally the capacity to anticipate the course of movement plays an important role. The task consists in moving an illuminated dot on a preset track, using two control knobs or two joysticks. 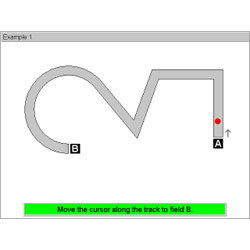 This track consists of three sections, which make different demands on the coordination of left and right hand. The dot is to be moved from the right to the left. S5: Administration with joysticks (inverted direction assignment),10 runs. The following variables are scored: Total mean duration, total mean error duration, percent error duration (calculated as the ratio of total error duration to total duration), and coordination difficulty. Internal consistency (Cronbach's Alpha) lies between r=0.85 and r=0.97. The content validity of the test is given since it has logical validity. Karner and Neuwirth (2000) showed that performance in the 2HAND correlates significantly (R=0.50) with an assessment of driving ability. These authors also found that individuals with a score of PR<33 received a significantly worse assessment of their performance in a standardised driving test. Norm samples of adults are available for all test forms. The sample sizes range from N=151 to N=244. In some cases norms are also available partitioned by gender, age, and education. In addition, some of the following special norms are also available for Forms S1, S2 and S4: traffic-psychological clients and various Swedish norms. Between 8 and 15 minutes (including instruction and practice phase), depending on test form.